The first point that I make clear with all of my clients is that no single nutrient works on its own to produce health effects in the human body. Your body needs dozens of different nutrients to survive and thrive, and every nutrient that has a nourishing effect on your body works together with other nutrients and your body's self healing mechanisms to keep you well. With that said, it's become exceedingly clear that vitamin D appears to be one of the most important nutrients we need to prevent all types of disease and live as long as our genetic potential will allow. Alarmingly, vitamin D deficiency is widespread in the United States, Canada, Australia, the U.K., and other industrialized countries where people have been taught to be afraid of the sun and/or they spend most of their days indoors. If you work indoors and do not get some exposure to sunlight on a regular basis (free of wearing sunscreens and makeup), it's quite possible that you are compromising your health by being deficient in vitamin D.
The fact is, it's extremely hard to get all of the vitamin D that you need to experience your best health without some exposure to sunlight. Without vitamin D production from exposure to sunlight, you would need ten glasses of milk that's been fortified with vitamin D to get the minimum amount of D that you need each day. And if you've been following our blog, you are aware of the many health challenges associated with consuming dairy products, including recurrent ear infections, sinus congestion and infections, eczema, psoriasis, rheumatoid arthritis, and many other chronic, degenerative health conditions. Salmon, mackerel, and other oily fish are good sources of vitamin D, but again, you would need to eat much more than is realistic for the average person to meet your minimum vitamin D requirement from eating oily fish alone. The bottom line is this: intelligent exposure to sunlight on your bare skin is the best way to ensure optimal vitamin D status. And with sunlight-generated vitamin D, you don't have to worry about having too much D in your system, as sunlight destroys any excess vitamin D that it generates in your skin. This is an important point, as having too much vitamin D in your system can be problematic. How Does Sunlight Create Vitamin D in Your Body? Sunlight contains ultraviolet (UV) rays that come in three different lengths: UV-A, UV-B, and UV-C.
UV-B rays are the ones that are capable of producing vitamin D in your body by acting on cholesterol found in your skin. Why is Vitamin D Important Again? There's a growing mountain of evidence that indicates that having enough vitamin D in your body is essential to reducing your risk of every disease that we know of. Every single one, no exaggeration. Cancers of the breast, ovary, prostate, colon, esophagus, pancreas, and leukemia. Colds, flus, and other infectious diseases like tuberculosis. How Much Vitamin D Do You Need for Your Best Health? Based on all of the most recent research that I have reviewed on this matter, I feel that an optimal range is somewhere between 50 and 60 ng/ml (125 to 150 nmol/l). To convert ng/ml to nmol/l, simply multiply by 2.5. Unfortunately, the only way to know where you're at is to ask your doctor to include 25 (OH) D, also known as 25-hydroxy D, with your blood work during your next checkup. Some labs test for 1,25 hydroxy D, which isn't as accurate a marker of your vitamin D status as 25 hydroxy D, so be sure to specifically ask for 25 hydroxy D.
You want your 25 hydroxy D level to be at least 30 ng/ml (75 nmol/l), but again, based on the research that I have reviewed, mainly that of Dr. Michael Holick, the optimal range appears to be 50 to 60 ng/ml. Some prominent physicians and vitamin D experts feel that one can go even higher, even up to 80 ng/ml. But my suggestion is to err on the side of caution and aim to be in the 50 to 60 range. The 50 to 60 range is based on numerous studies that show strong relationships between these levels and reduced risk of a wide variety of chronic diseases and increased lifespan. This range is also based on the 25 hydroxy D levels of healthy people living in areas of the world (tropical and subtropical regions) where it's quite common to receive more than enough sunlight exposure to ensure regular vitamin D production. But here's an important point that you want to keep in mind: When sunlight creates vitamin D in a healthy person and that person's 25 hydroxy D is in the optimal range, that person is almost certainly benefiting from other natural compounds that are generated with sunlight exposure. Dr. Holick calls these other compounds "photo products," and he and his team are currently researching the makeup and benefits of these photo products. Put another way, establishing optimal vitamin D status mainly via healthy sunlight exposure may provide more health benefits than establishing optimal vitamin D status mainly via foods and supplements. Correct usage of foods and supplements only gives you the right amount of vitamin D - they don't generate the photo products that sunlight does. As more information about these photo products becomes available, I'll be sure to provide an update. At the same time, it's worth remembering that even responsible exposure to sunlight comes with some undesirable effects, like premature aging of skin and possibly increased risk of non-melanoma skin cancers, depending on your history of sunlight exposure. So it's too early to say which is more desirable between getting vitamin D mainly from sunlight vs. mainly from foods and supplements. What we do know for sure is that keeping your 25 hydroxy D level somewhere between 50 and 60 ng/ml, possibly even up to 65 ng/ml can significantly decrease your risk of all types of disease and increase your lifespan. And a wise approach is likely getting vitamin D from a combination of responsible sunlight exposure and foods and supplements that come with vitamin D.
It's near impossible to provide specific recommendations in this area because of the many factors that affect your ability to generate vitamin D from sunlight. But we can provide general guidelines that should be helpful. First, take a look at the map below and determine which zone you live in. If you live in the tropics or subtropics, you have access to UV-B rays from the sun year-round, so it's quite possible to get most or all of your vitamin D requirement from responsible exposure to sunlight, though recent studies indicate that a significant percentage of people living in Florida are vitamin D deficient because they just don't get enough exposure to sunlight. 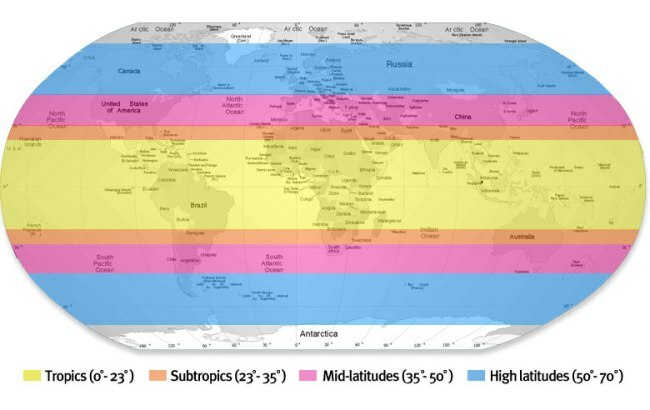 If you live in the mid-latitudes or high latitudes, you have little to no access to UV-B rays from some point in autumn to some point in spring. During these times, your body has to rely on its stores of vitamin D and/or vitamin D from foods and supplements. It's possible to live in the tropics and subtropics and not make enough vitamin D from sunlight alone. And it's possible to live in the mid-latitudes and high latitudes and have enough vitamin D in your system without eating vitamin D-rich foods and supplements throughout the winter if you generate sufficient reserves during warmer months. The point is that if you live in the tropics or subtropics, you can likely get a good chunk of your vitamin D from sunlight, and if you live in the mid-latitudes or high latitudes, you can probably benefit from supplementation through diet. Estimate how long it would take your skin on any given day to turn a shade of pink from sunlight exposure. This is called a minimal erythemal dose, and it varies depending on a number of factors like time of day, time of year, your skin color, age, the latitude and altitude of your location, and how clear or cloudy the sky is. Put another way (and this may be more helpful to people with darker skin color), your minimal erythemal dose is the amount of time that you need to feel like you just started to tan without coming close to getting burned. Your skin will feel like it has extra warmth to it. Aim to expose your bare arms and legs to sunlight for about 25 to 50 percent of the amount of time that represents your minimal erythemal dose. Clearly, this amount of time will vary from day to day and season to season. Dr. Michael Holick has tables in his book, The UV Advantage, that provides guidelines on how many minutes this would be for six different skin types at different times of the day and different months of the year for the four zones shown in the map above. If you want this type of guidance, it's best to purchase his book for these tables. If you prefer more of a natural and instinctive approach, you should just aim to get enough sunlight on your arms and legs to feel like you're getting about halfway to the point where your skin will feel like it has gotten a healthy tan. This is possible practically year-round for people living in the tropics and subtropics, and only possible from sometime in spring to sometime in autumn for people living in mid or high altitudes. For days when you have to be under the sun for longer than about half of your minimal erythemal dose, once you get to this point, you can use protective clothing and hats, non-toxic sunscreen, or a combination of protective elements to ensure that you don't get burned. Do You Need to Take a Vitamin D Supplement? The easiest way to figure this out is to have your blood tested for 25 hydroxy D. If you're below 50 ng/ml, you can get more vitamin D through sunlight and/or take a vitamin D supplement. If you live in the subtropics or tropics and you aren't shy about getting sunlight exposure, chances are that you don't need to take a vitamin D supplement, but again, the only way to be absolutely sure is to get a 25 hydroxy D test. If you are indoors quite a lot, tend to stay out of the sun, and/or live in the mid or high latitudes, chances are good that you can benefit from vitamin D supplementation. Seventy-six percent of pregnant women were found to be severely deficient in vitamin D.
Eighty-one percent of babies born to women who were vitamin D deficient were deficient themselves, predisposing them to diabetes type 1, multiple sclerosis, schizophrenia, rickets, and a number of other diseases. Thirty-two percent of physicians and medical students were vitamin D deficient. Up to sixty percent of all hospital patients and eighty percent of nursing home residents are D deficient. Forty-two percent of African American women of childbearing age were D deficient. Close to fifty percent of girls between 9 and 11 years of age were vitamin D deficient. Ask physicians who regularly check 25 hydroxy D levels in their patients, and I'm confident that they'll agree that vitamin D is easily the most widespread nutritional deficiency in today's population, especially among the middle and upper classes. Keep in mind that for every 100 IU that you ingest, you raise your 25 hydroxy D in ng/ml by about 1. These days, I rarely encounter a person who can't benefit from adding an additional 1,000 IU to their diet above and beyond what is obtained through sunlight exposure and eating the foods listed above. Dr. Holick feels that every adult and child needs to take a minimum of 1,000 IU of vitamin D along with a multivitamin that contains 400 IU of vitamin D.
With the testing that I have done with clients over the years, I have found that the average person needs a minimum of 2,000 IU of D-3 daily, which is why I included this amount in each serving of our organic whole food multi. This formula is also available in capsule form here: organic whole food multi in capsules - a single serving of 6 veggie capsules provides 2,000 IU of D-3 plus many other health-enhancing nutrients from organic greens, organic red beets, organic cherries, and organic pomegranate. I've even run into some clients who needed to increase their intake to 4,000 or 5,000 IUs, and in one case, 10,000 IUs per day to get their 25 hydroxy D into the optimal range - this last case was a woman who suffered with a severe deficiency (15 ng/ml) and symptoms of osteomalacia. I realize that all of the above is a good chunk of information to digest. I encourage you to take your time in considering all of this information and really invest some effort into making sure that your body has enough vitamin D year-round. The science surrounding the human body's need for vitamin D is groundbreaking in every way, and ensuring that you are getting enough is a guaranteed way of significantly improving the quality and length of your life. It was impossible for me to include everything I wanted to in this post, so I'll be writing shorter bits that explore different facets of vitamin D in the coming weeks. If you have any thoughts on this topic that you'd like to share, please use the "add new comment" featured below. Hi, I was wondering what things make a good vitamin D supplement? Conversely, what makes a poor supplement? Thank you for all of your clearly written, accurate, and informative articles!! This article helped give me more insight into seasonal depression and the connection between the sun, vitamin D and cod liver oil and how they all relate. It also helps me to understand yet another reason why Omega 3's or cod liver oil is so important!! Thanks for a highly informative article. The map, however, leaves something to be desired in its accuracy. Ceduna, situated near the top of the Great Australian Bight, has a latitude of 32 degrees, and around 10 minutes. CEDUNA is nestled on the shores of Murat Bay on a Latitude 32 degrees South, that is over 300kms North of Adelaide. Adelaide has a latitude of 35 degrees. Your map shows latitude 35 degrees South as being around 200 kilometres north of the top of the Great Australian Bight, when Ceduna, at 32 degrees, is a fishing town on the coast! Adelaide, at 35 degrees is actually where the pink zone should terminate; around 400 km South of where it is shown. Kindly check this out at Google, Earth, and on an Atlas. A similar error may have occurred for the Northern Hemisphere, but others are the best judge of that. I am a resident of Adelaide. Thank you Dr. Kim for being just one more professional that endorses Vitamin D3! I am 58 years old and have known about the benefits of this vitamin for a couple of years, and have been taking 14,000 IU per day for that time period. I have noticed a marked difference in my overall health, more energy, better sleep, less aches and pains,no sickness! I have never had my blood level checked, and I probably should do so but I think it has been very beneficial to me so far. I recently did have a blood test with all my hormone, cholesterol, glucose, liver, kidneys, etc levels checked and all were within normal range. I am very healthy! I hope other people really get the importance of taking Vitamin D3 too. This is actually a comment on the blog post rather than a reply to the above comment, but I could not locate the place to comment otherwise. Thanks Dr. Kim for a very informative post. However, I think it is important to stress that when you are talking about exposing the bare skin to sunlight, this means exposure without sunscreen. Although you have alluded to this, I think that because people are so accustomed to wearing sunscreen when outside (the reason why so many of us are deficient in Vitamin D), it may not occur to them that the term 'bare arms and legs' does not apply simply to clothing. Also, I believe it is important to stress to those who buy Vitamin D from source other than your website, that they should get the natural form - Vitamin D3 - which is the form produced by the skin in response to sunlight. I am surprised that the medical establishment isn't coming out with more about the causes of the epidemic in vitamin D deficiency. It must be costing the health system millions of dollars. The aerosol spraying program, now called geoengineering, and which has been going on for years, especially in the last two years, has caused dimming of the sun, to the point that here in Ottawa, I haven't seen a sunny day, without haze caused by the chemtrails for many months. Even if a day starts off sunny, the planes are up there leaving their trails, and yesterday the sunny day had become overcast within an hour of the spraying. We need to let our politicians know that we refuse to allow them to contaminate our air and rob us and our children of sunshine. Super additional information! Now you can personally check your level at home w/o a blood draw which most labs require. I don't want to puncture my veins to chech my vit D3 level but i surely don't mind to prick a finger. Hey there! I'm at work browsing your blog from my new iphone 4! Just wanted to say I love reading your blog and look forward to all your posts! Keep up the superb work! What do you think of the new mushrooms (if you're familiar with them) I've been seeing in grocery stores that claim to have 100% RDA of vitamin D in one serving? If I'm not mistaken, the process of growing mushrooms in the sunlight for a certain amount of time triggers a similar vitamin D producing mechanism as in humans resulting in a form of pro-vitamin D, that, when ingested, can be converted to actual vitamin D in our bodies. Do you know anything about this and would you say this could be a good source of vitamin D for us? I, unfortunately, have a very tragic relationship with the sun, as it burns me within seconds, and would prefer not to rely on it much for my vitamin D supplies. According to what I have read in numerous sources, certain mushrooms will only produce vitamin D2 which does not have the same potency as the vitamin D3 produced in our bodies from sunlight. Vitamin D2 has a totally different molucular structure then vitamin D3 so vit D2 cannot be converted to vit D3 in the body. Furthermore, vitamin D2 has been claimed to have a physiological potency of about 25% of D3 but I'm not sure whether the mechansims for "wellness" are the same. I do know that vitamin D3 affects about 2,000 different genes and affects the genes like a switch by delivering itself into the nucleus of each cell like all the other natural steriod like molecules do within our cells. By attaching itself to a specific gene which is a section of our DNA, it will act as a switch by allowing these genes to be turned on or off as well as acting as an amplifier for producing a large number of proteins of a specific nature like many of our steriod hormones do like testosterone and cortisol. I'd be scared to eat something that has been genetically modified by man so much that the mushroom has all the vitamins we need. I understand vitamins, but our food? There have to be huge downsides to that and we don't know what they are yet. Neither do they. From what I understand this is the same old crimini mushroom you'd see in the store, treated with sunlight for a few hours or days before harvest. They do apparently generate a lot of D3 in a short time. It's easy to do so I expect to see more of them. Thanks for the article, and others on this site. Dear Dr. Kim, as always, your articles are very informative and I would like to thank you for sharing this information in a very thoughtful manner- you make any topic so easy to understand. Thank you so much for caring genuinely about other people's health. What I often wonder about is, in which frequency each vitamin needs to be taken to keep them in our bodies at optimal levels. Or in other words, e.g. I believe the body can have reserves of fat for months, while we should recharge our body with carbohydrates at least once a day. But what about the vitamins, as well as minerals and protein? And which foods can be consumed cooked without a substantial loss of the vitamins, and which foods are better eaten raw. E.g. I read that unlike most sources of the vitamin C, the one in rosehips is considerably more heat resistant. Hi Ben - I was just tested and found to be deficient (not surprising given how common this is). I was given a supplement to take daily over the course of a week, then one per month for two months after that. Does the body store Vitamin D or should I be taking a supplement daily? Also - given that it takes about five mins (literally) to burn here in New Zealand (blame the ozone hole) - getting enough sun without risking melanoma is a hard ask in this part of the world. I wear a sun hat and clothing that covers my skin everywhere, as I have already had one cancer removed and am doing my best to avoid any more. I'm so glad you raised this issue - I have had very little guidance from the medicos on how to best avoid deficiency in future. Thanks - from your kiwi buds! Dr.Kim - I know you have heard this many times - but we love you and how you use yoru life to serve others - to make their lives better - thank you! I enjoyed you article. Thank you. I wanted to mention that when taking vitamin D supplements they should be taken with food(its a fat soluable vitamin and needs fat to be absorbed into the body). You are a top notch communicator. You write such understandable sentences. Your information presentation flows so smoothly. You are better than WebMD, and they are pretty darn good. I praise the Lord that I found you every time I read your website. My fantasy is to emigrate to Canada to have you as my personal chiropractor. Until that fantasy comes true I will read your website. Thankyou Dr Ben for this exhaustive information. I am currently living in India and working in an IT industry with barely any exposure to sunlight (May be 15-20 mins if I am lucky). Your informative articles have helped me to improve my eating habits and in turn the overall health. Thanks once again. Great Timing for Me to Read This! There's nothing like having a recent copy of one's lab report results laying right next to the computer while reading an article on health! My doctor pointed out last week that I am highly deficient in vitamin D (16 ng) and has given me a prescription. After reading your extremely well-written article, I am definitely going to be taking my prescription strictly on schedule, instead of hit-and-miss. Thanks, Dr. Kim! You made me understand the vital importance to my health! ...this is a GREAT article. Sums everything up we need to know, yet not too complicated. You are a good writer. I was wondering about the full spectrum lights or lamps......I do take 2000 IUs of vit D3 but work in a windowless office all day with fluorescent lights up above....I hate it. Do you know if it is worth it to buy a full spectrum lamp they say helps with "SAD" ? What are some good sources of food for vegetarians or vegans? Do vegetarians and vegans ever take a microscope and look at the teeming wildlife that is found on their salads and which supplies them with protein? from where they are grown. You probably do not know but all processed foods acknowledge contamination, for instance in PEANUT BUTTER, there are a certain amount of rat hairs allowed per container (yuk). emotionally the way chickens, cows or pigs are mistreated. All children should take a field trip to slaughterhouses and see how the meat gets on their tables, it is quite inhumane to witness the process. Many people wait until they have sever health problems to change their diet to a meatless one when they finally understand how years of consuming animal fat have clogged their bodies. look into a man named Howard Lyman--he used to be a huge cattle rancher with thousands of animals until he wound up in the hospital with life threatening heart problems, then and there he decided to give up meat and his cattle ranching. He is now a vegan who writes books and travels lecturing on his new way of life and the truth about the meat industry he was once fat with. Even where the bible mentions "meat" it does not mean animal flesh--"let every herb and seed, for you it shall be FOR meat". Having been a vegan for many years and having also been a fourth generation cattleman, I can candidly say that the slaughter process is anything but inhumane. The animals are killed instantly and are not subjected to pain. There are as many reasons for being vegan as there are vegans. Concern for the animals is but one. Thanks for the essential information on the large scale deficiency in Vit D for most people and for describing how to increase Vit D through sun exposure and supplements and foods. Are there any vegetable sources of Vit D, or are they only through fish? And for those who reside in high latitudes, do “tanning beds” with tanning induced through artificial lighting allow one’s skin to produce vit D, or are the artificial wavelengths not harmonious with natural vit D production through the skin? Never use a tanning bed! I am in my 40s and am a skin cancer survivor. I learned that using tanning beds (which I did very very seldom in my 20s) increase your chances of skin cancer by 75%. Yes, you read that right. I can't believe they are legal. Never use tanning beds, people! Go out in the sun or take Vitamin D oil/capsules. DON'T USE TANNING BEDS. My dermatologist says that regular Vitamin D consumption is also recommended for strengthening my immune system against future skin cancers. Good levels help our bodies protect against skin/sun damage. It all works together. Great article on vitamin D. I read Dr. Holick’s book "The Vitamin D Solution'" and I found it to be so informative and helpful with my three year vitamin D deficiency. I have Lupus and Polymyositis and have been vitamin D deficient since becoming ill and I have taken the prescribed vitamin D capsules and they helped but, I continue to be vitamin D deficient. I followed his information in the book and though I physical do not feel better, I do notice that my fatigue level has improved since getting my 15 minutes of sun three days a week. I go for my blood work in a couple of months and I can't wait to see if my levels have improved. Hello Dr Kim, thanks so much for the excellent and thorough info about Vit D. I went to the doctor the other day on another matter and he ordered a full listing of tests to be done and found amongst it that my Vit D count was only 13. I was surprised being that low, but I am more an indoor person who really didn't think of such matters. I have started taking Vit D tabs and will keep in kind this other information you have provided. Much appreciated. I've read in another article that the body requires 48 hours to absorb the vit. d created on the skin through sun exposure, and so bathing with soap washes off the vit d created on the skin. Read the whole posting, all the links and am delighted by your style, expertise, non-flamboyant common sense approach. Blessings to you and your family. What about Vitiman K2 in relation to vitiman D3 absorption? Vitamin K2 is helpful to the absorption of Vitamin D3. Dr. Kim has found that many clients get plenty of K2 from their diet (he is a big supporter of eating miso, kim chi, and other fermented foods that provide K2.) Many also take quality probiotics, which help ensure a healthy flora that constantly produces K2. He has long found that vitamin K2 is most effective when it comes from a fermented food; several patients over the years have tried periods of relying on synthetic supplemental K2, and results have not been anywhere near what they have been for clients who regularly eat fermented foods. I trust this will be helpful to you! I can't take vit D3 without getting severely constipated. I understand this can happen if deficient in magnesium. The conundrum (for me) is that magnesium supplements are hard on my gut. I'm not a big fan of supplements for these reasons and would really appreciate any information that might be helpful. Thank you Dr. Kim for all your helpful articles and insights. I trust you more than the overly commercialized and hyped Mercola and Axe...what you share feels like it comes from the heart and is sensible and truly meant to help others. I sense that you have a good heart and am grateful for that. Thank you Dr. Kim the timing of this article could not have been more perfect. I just received my lab results back and found out that I am deficient in vitamin D. I have been reading your articles for a number of years and all of your information has proven to be such a valuable resource in empowering me to be a better advocate in getting my body to a healthy state through more natural means as opposed to all the pharmaceuticals my doctors recommend.